Hard water reduces the productivity of any pesticide, fertilizer and plant growth promoters due to less absorption of spray elements which increase cost of production & number of sprays. 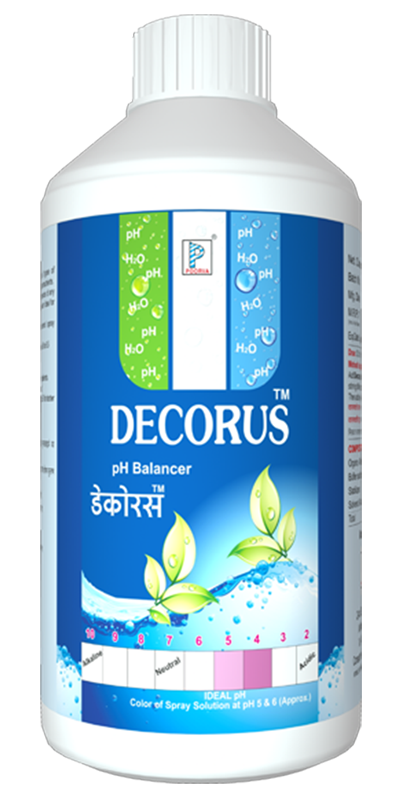 Use of Decorus will purify spray water by reducing pH of water. Use of Decorus will increase nutrient/spray elements absorption. Ideal pH of spray solution should be 5.5 to 6.5, studies shown that plant absorption capacity is highest at this pH. Use of pH reducer avoids consumption (salt formation) of active spray ingredients due to high pH. Measure pH by pH meter or pH paper before and after application. After adding pH controller, do stirring of water and add active ingredients after 5-7 mins. Do not mix directly with concentrated active ingredients. pH of spray solution should not go down than 4. Keep the pH of spray solution between 5.5 to 6.5 for better results. For normal low pH water (pH- 7 to 8)- 0.25 to 0.5ml/Ltr. In higher pH water (pH- above 8) - 0.75 to 1ml/Ltr.